An unusual friendship, at a construction site, between Kurshid Dabdi, her colleagues and six children, led to the foundation of Sunbeam in 1999. The idea gained momentum and the first centre was set up at Arthur Road with 18 children. Kurshid Dabdi was an employee of Child Rights and You (CRY), and its office was adjacent to the construction site. The immediate needs were thus met with support from CRY. The school expanded with financial aid pouring in from CRY staff across the country. Today, Sunbeam provides a comprehensive programme emphasizing education, recreation and community development to more than 1,500 children living in the slums and chawls of Mumbai. Sunbeam follows a three pronged approach to education: prepare the child for formal schooling, enrol him/her in a formal school and follow up to ensure retention. Sunbeam has two main centres and classes are conducted in various places: a temple courtyard, a room in a chawl, classrooms in municipal schools, and shed at a construction site. Children from families with an income of less than Rs10,000 are approached by outreach workers. These children are then assessed and segregated in Sr. KG, Class 1, 2 and 3 based on their aptitude and age. Sunbeam runs general batches for children who can cope with the academic level. Revisions and tests are conducted to ensure the children are well versed with their syllabus. The children who lack the desired academic level of the class in their formal school or who have never attended school before are enrolled for bridge courses. Bridge courses are mostly conducted for children in the age group 5 to 10 years. Special attention is given to these children to bring them on par with others of their age and academic level. All the children are provided with school bags and stationery. Sunbeam conducts batches in two sessions with around 60-65 students per batch. The teaching at Sunbeam is geared towards integrating children into formal schooling. Sunbeam sponsors partial fees of the beneficiaries enrolled in professional coaching classes for higher education. The children who lack the necessary aptitude or cannot continue studies on account of family reasons are enrolled for one year of vocational training. Sunbeam enjoys support of parents willing to be part of the positive change in their child’s life. The parents participate in community meetings and coax reluctant parents to cooperate. Donations: Donations ranged from 45% to 89% during FY10-13. 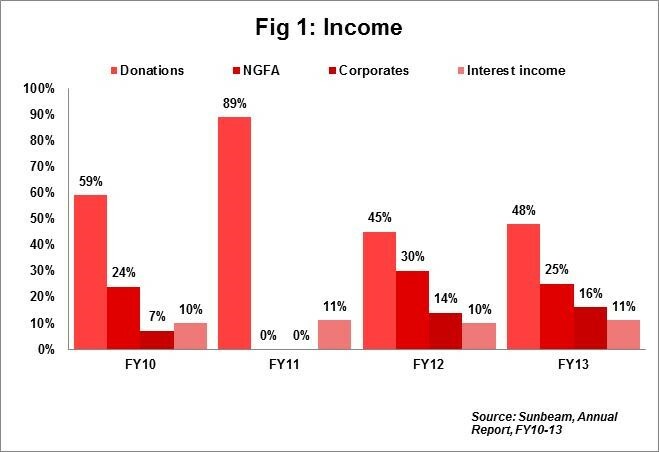 Sunbeam raised most of its income through donations in FY11 (89%; Rs6mn) but has since diversified its income sources. In FY13, donations from individuals accounted for 48% (Rs4mn) of total income. General and administration expenses and recreation expenses are entirely funded by individual donations. Non-Government Funding Agency (NGFA): The NGO procured funds to the tune of Rs2mn (25% of total income) in FY13 from institutions such as Dr. & Mrs. S.H.M. Modi Hormus House Benevolence Trust Fund, K.C. Mahindra Trust, Pirojshah Godrej Foundation and few others. Corporate Sources: In FY13, IL & FS Investment Managers Ltd, U.H. International, West Wind Association and PID Pvt Ltd were Sunbeam’s major donors in corporate sector. The contributions amounted to 16% (Rs1mn) of total income in FY13. Programme expenses: Expenses totalled Rs9mn in FY13 with 95% of total expenses incurred on programme activities. Salaries paid to programme staff are included in programme expenses and separate breakup is not available. 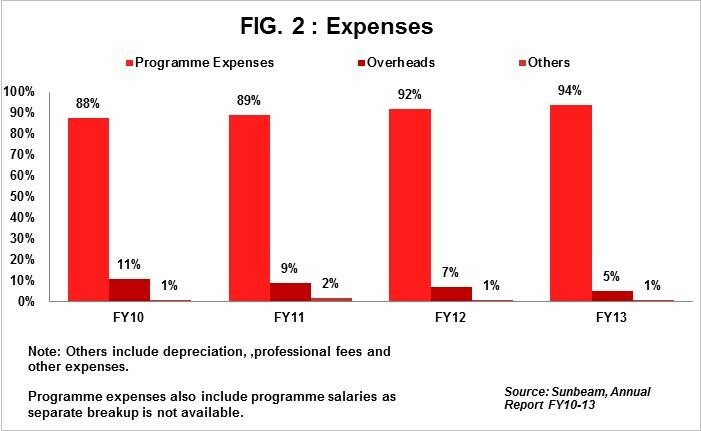 Programme expenses have been in the range of 88% to 95% during FY10-FY13. Overheads: Overheads have registered a decreasing trend from 11% (Rs0.7mn) in FY10 to 5% (Rs0.4mn) of total expenses in FY13. Reduction in overheads Y-o-Y indicates effective utilisation of funds by Sunbeam. Salaries paid to administration staffs are funded from the interest received on corpus investments. Fixed Assets: Sunbeam operates out of centres rented at nominal cost. Hence, fixed assets account for 1% (Rs0.1mn) of total assets and include furniture, printers and computers. Investments and Trust Corpus: Investments accounted for 91% of total assets in FY13. The entire corpus to the tune of Rs12mn and an amount of Rs1mn set aside as general funds has been invested in fixed deposits. Trust Corpus stood at 84% (Rs12mn) of total funds in FY13. Corpus fund has been in the range of 84% to 87% during FY10-FY13 with a CAGR of 11%. Sunbeam enjoys incredible support of friends and advisors who donate towards its corpus. General funds: General funds have sharply increased from Rs0.7mn in FY12 to Rs2mn in FY13 on account of receipt of funds to the tune of Rs1mn. Income Growth Rate: Sunbeam posted total income of Rs9.5mn in FY13 witnessing a marginal increase of 6% over total income of FY12 (Rs9mn). The NGO has reported a CAGR of 12% during FY10-FY13. Self Sufficiency Ratio: The ratio indicates ability of an organisation to meet expenses from own funds. The self-sufficiency ratio for FY13 is 61% as the NGO managed to source 61% of total income from own funds which includes individual donations, interest income and beneficiary fees. Positive impact: The children studying in the centres consider the free coaching Sunbeam provides them as their greatest gift. Donors and visitors to Sunbeam come away feeling reassured that their donations are being utilised in the best possible manner due to the positive feedback from the children that they meet. Space constraint: Sunbeam conducts its classes in a marriage hall and a local school. At time of functions, the hall is not available and the classes have to be accommodated in some other place. Similarly, the timings for the classes in the local school have to be adjusted to suit the exam timetable of SSC Board. Staff constraint: Sunbeam faces high turnover of staff on account of low pay scales. The teachers prefer to join formal schools after a year or two. Also, the existing staffs teach students upto standard three. There is need for educated and dedicated staff for taking senior classes. Absenteeism: The class has more or less 100% attendance except during festivals. At festival times, the children avoid coming to classes because their parents are busy or they go on to visit their hometown etc. The members on their Board are either associated with CRY or with reputed corporate houses. Sunbeam has garnered great backing from its friends and supporters in the form of their valuable time and skills for its betterment. Sunbeam shares progress report of the children with trustees and donors twice a year i.e. midterm results in November and annual exam results in April. The Board meets four times a year.